This year the Treasure Valley Institute (TViSTEM) will be June 25-28 at College of Western Idaho (CWI) in Nampa. Over these four days, participants attend a workshop strand, participate in general sessions with keynote speakers and network with other educators. Participants leave with a kit of materials related to the workshop strand they attend, ready to implement what they have learned into their teaching environments. This professional development opportunity is open to formal and informal educators. APPLICATION TO ATTEND IS CLOSED. Successful applicants will be notified in early April by STEM Action Center. E is for Engineering! Engage your elementary-level students in an engineering curriculum that builds the whole word STEM. 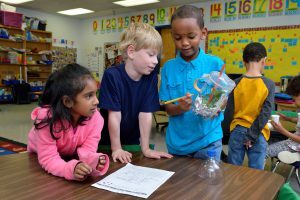 Engineering is Elementary is a nationally recognized elementary school engineering curriculum that integrates science, math, social studies, language arts, and 21st century skills authentically. 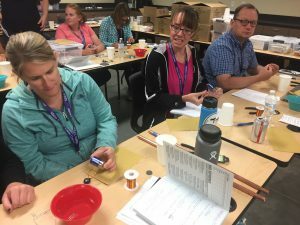 Participants will learn how to implement two curricular units and leave with the necessary knowledge and materials to implement these units in their classrooms and adapt them to the needs of Idaho’s elementary school students. A field trip to the research facilities at Simplot will build connections between units and real-world applications in engineering and agriculture and the impact of agricultural engineering on our local community and economy. And a visit from the Ada County Abatement District, will share how they use science and engineering practices to serve our community. Innovation, problem solving, designing, and thinking divergently all happen best when creativity is nurtured. This strand combines the neuroscience of creativity with the physical act of creating to dive deep into answering the question: How might we best foster creativity in developing minds? 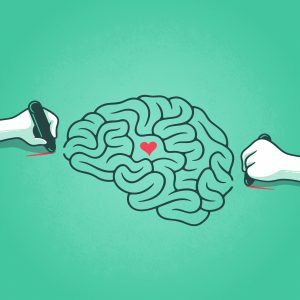 Using neuroscience principles, art will be the medium for exploring how creativity works in the human brain, and how it is valuable not only to make art but as a whole-brain approach to teaching and learning. Using the Human Centered Design method of problem solving opens the ability for participants to actively explore their own innovative capacity, create tailored solutions on-site, and take the experience back to use again or introduce to their students for future problem-solving. Potential field trip to local art studio. Kit: Design Thinking for Educators Toolkit + Workbook, a set of Big Life Journal's 3 Seas cards to spark discussion and inspiration around growth mindset and creativity, classroom set of drawing pencils , 3 months of "From Doodles to Design" digital art course. Explore the basics of environmental education (EE), including why it’s important and why it works. Experience engaging, hands-on, FUN, standards-aligned activities that take students from environmental awareness to responsible action. You will be introduced to three award-winning EE programs - Project WILD, Project WET and Project Learning Tree - which provide proven activities for teaching K-12 students about wildlife, water, trees, forests and the interconnections of the natural and built environments. The Projects incorporate real-world lessons that help students gain content knowledge and develop skills to ask questions, investigate, propose solutions, and take responsible action. In this course, teachers will use project-based and inquiry focused learning to explore local complex issues, explore outdoor areas while participating in active field experiences and tour a facility that highlights STEM careers. Leave the class motivated and equipped to share EE with your students! Field trip: Boise WaterShed Education Center, Wilson Pond, Packaging Corporation of America. Kit: Project WET curriculum guide, Project Learning Tree Guide, Paper Making Kit, Laminated Water Cycle Posters, How a Pencil is Made Kit, LaMotte Water Testing Kit, Fishing Set, Knot Tying Kit. 3, 2, 1 Energize your classroom with STEM lessons on work, power and energy. Energy is all around us from morning to night our lives are full of energy. Explore energy, work and power in toy design, solar and wind power. Come join us for physics phun with energy. This Energy strand is designed to integrate Science, Technology, Engineering and Math in the science classroom. Science concepts are introduced and reviewed in briefings and debriefing labs. The lab activities are designed to engage students with technology and engineering design. The students learn the math principles needed to analyze data collected Participants will participate in classroom ready STEM activities for energy, work and power. All activities will be inquiry based and use the concepts of design or redesign. Teacher participants will leave with a Project Based Unit in Energy. The field trip will include a trip to the local energy generating plant and participants will get the opportunity to hear from speakers from local energy companies. Kit: Spring Cars, Hot Wheels Parts Kit, Turbine Kit, Hover Craft, Retractor Car, Car on a Roll, Jitterbug, Come Back Can, Construction Material kit. Have you ever wanted to learn more about Idaho’s geology and fossil history? Now you can! And, you can share with your students! 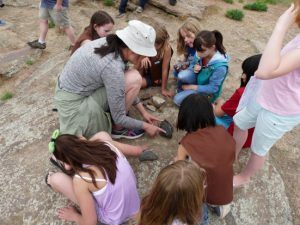 Explore Idaho’s geologic and fossil history through a series of activities that review geologic principles and earth processes. 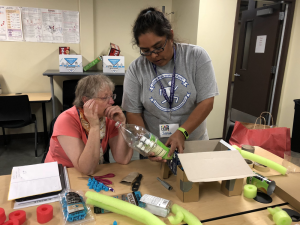 Connect your cool new knowledge to Idaho’s new science standards while building a project-based learning unit. Each day participants will unravel Idaho’s natural history as they use geologic principles and processes while traveling through geologic time. Come experience adventure learning with field trips to local museums and a field day! Kit: Hand held electronic microscope, hand lenses, geologic map, fossil samples, rock samples. Have you ever used a paper circuit to teach about the nature of science or discover the REAL primary colors? (NOTE: the primary colors are NOT red, yellow, and blue!) If not, don’t miss this opportunity to open doors for your students through the creative use of #STEMontheCheap paper circuits. We’ll also explore electricity from the ground up, using dozens of minds-on, hands-on activities as we learn about primary sources of energy, electricity production, energy efficiency and more. You’ll even discover how to use the physics of electricity production to transform a paper cup into a radio speaker, as well as lead engaging discussions around one of the biggest challenges of our day - sustainably meeting the energy needs of a growing world population. Come be amazed at the questions you’ve never asked before about how energy really works! Oh, and you’ll leave with everything you need to immerse your own students in each and every experience, engineering their own projects, building their own circuits, and with a burgeoning understanding of electricity and the energy decisions that lie ahead. Hear from guest speakers from Idaho Power and Intermountain Gas and go on a field trip to Langley Gulch Power Plant. Kit: Paper Circuit Supplies, Electromagnetism Demos, Transmitting Electricity Supplies, Cup Speaker Supplies, Kill-A-Watt Meters. Is coming up with low-cost, high-interest STEM activities challenging? This strand will walk you through ways to reuse and re-purpose low-cost items to get the maximum output. 3-D printing, VR and more will be explored through hands-on activities. 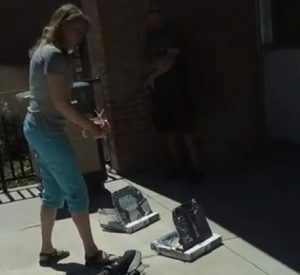 You will explore matter, make catapults, build rockets, create circuits and many other center activities that you can include in your classroom and incorporate into everyday lessons and units. It's a hands-on experience! Leave with project-based units that naturally incorporate STEM, while learning how to get the most out of your classroom materials. Field trip to local maker space. Kit: 3D printer, VR goggles, Edison robot, catapult, building materials, and more! How does climate change influence Idaho’s natural and human systems? How can we better understand the causes and consequences of increasing temperatures on wildfires, agriculture, and water resources? How can we best equip our students with the knowledge and understanding they need to address the challenges and opportunities of global change? Understanding global change and how to mitigate the causes and consequences of anthropogenic activities are now essential topics to address in K-12 education and requires educators to interweave best practices with new resources. 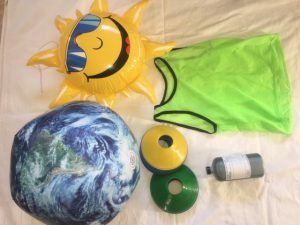 Teaching the Earth as a system is also a key feature of the Idaho State Standards and the Next Generation Science Standards (NGSS) to connect biology, chemistry, physics, and Earth science content. Whether you are developing, implementing, or supplementing curricula, the resources and methods shared in this course will enhance your efforts. Field trip: Visit to nearby soil site (farm) and potential trip to National Interagency Fire Center. Kit: Understanding Global Change educator kit (large laminated posters, icons, teaching materials), greenhouse gas tag kit (inflatable Earth and Sun, tag materials), soil kit, wildfire demos, and tree-coring kit. Ever heard of the butterflies and the bees talk? That’s right. It’s a talk we need to have. And it’s a talk you need to have with your students. The butterflies and the bees are disappearing, and we need to learn more about what that means for our local landscape. 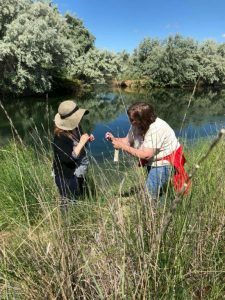 In this strand, participants will learn how to use the current pollinator conservation crisis as an example of a pressing conservation issue to create place-based, experiential, and immersive curriculum to meet Idaho Department of Education Content Science Standards. 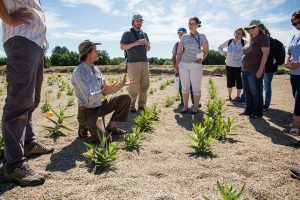 Strand participants will learn about pollinators, their ecosystem connections, and conservation through classroom education as well as field exercises. Participants will also learn about and engage in pollinator conservation activities and citizen science that is transferable to the classroom. This strand will culminate with a workshop designed to aid teachers in the development of project-based learning curriculum that focuses on monarch butterfly and pollinator biology, ecology, and conservation. Field trip to Roswell Marsh. Kit: Field guides, materials for native plant seed propagation (germination trays, soil bags, pots, etc. ), field exploration equipment (magnifying glasses, aerial insect nets, insect collection vessels, pollinator sampling materials, pan traps, etc. ), materials for interactive monarch migration and habitat game.